Marc Goossens, the 2005 Belcar Champion, was desperately disappointed not to have the opportunity to continue racing for Patrick Selleslagh’s team this year, in the familiar SRT Corvette C5-R. But he’s going to be ‘getting up to some mischief’ in the series this year anyway – racing a Marcos LM600 for Wim Noorman’s Eurotech team. The team owner will be the champion’s co-driver. Eurotech raced in Belcar for two years with an evolution of the Mantis (2003 and 2005 - right) and is now ready to go for overall victories. Marcos vs. Corvette vs. Viper vs. ….. Ferrari, in Class 1? Sorry - Goossens' team-mate will be Danny van Dongen. 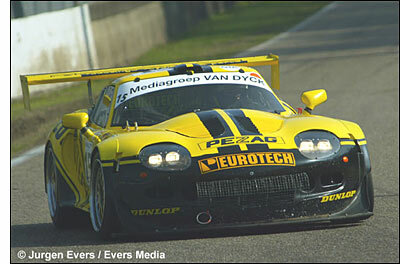 van Dongen was Belcar junior champion in 2003 in a Marcos Mantis+ which he shared with Toon van de Haterd. In 2004 he raced in Spanish GT's with Cor Euser - writes Arjen Bleeker.